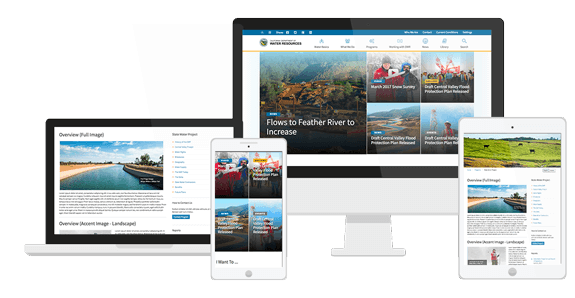 The California DWR needed a modern content authoring platform to meet the demands of a growing content authoring team with a multi-tier approval system. At the same time, a visual refresh was required to bring the website into accessibility compliance and up to date with the latest version of Califirnia’s government template. SymSoft implemented Sitecore CMS with a custom configuration of workflow-based content authoring the meet the requirements of the DWR. Our team also helped plan and conduct a large-scale content migration to the new system. The new website is able to meet the demands of a more rapid content cycle, with many DWR authors simultaneously contributing content to the new system. Due to the large volume of content within the DWR website, tagging is very important to provide useful search and filtering functionality. The wide variety of DWR content authors obtained two layers of training to update content within Sitecore. First, basic training was conducted directly by Sitecore expert facilitators. At a second level, SymSoft provided solution-specific training to the same authors.